If I could pick the single most productive exercise in existence, it would be the squat. Squatting is the cornerstone of leg training and should be a staple of most routines. But many people simply don't squat. Why? There are a number of reasons, but it seems the major one is they simply don't know squat and about squats! Naturally, if you don't know how to do an exercise properly, you're probably not going to want to do it. Proper form is very important for getting the most out of the squat, not to mention avoiding injury. Once you know proper form, you'll feel much more confident about doing the exercise and you'll be able to harness its power. In this section, you will learn how to properly set up a squat inside a squat rack, where to place your feet, where to set the bar, and how to do the movement itself. At the end of this section will be a link to a page that includes pictures for the exercise. - Set up the racking pins in a squat rack at a position a few inches below shoulder level. This allows you to get the bar on and off without catching it on the racks. - Set the safety rails at the bottom just slightly lower than the lowest point you go down in case you fail in the movement. Set this level conservatively at first. As you get more confident with the movement, you can lower yourself down further. - Rest the bar across the back of your shoulders like a yoke so it is supported across the trapezius muscles. It should be across the ridges of your scapulae (shoulder blades), resting just below your seventh cervical vertebra. Basically, the bar shouldn't be up on your neck but also shouldn't be too far down your back. - Find your own groove for bar placement. Everybody is different when it comes to where they are comfortable with the bar. - Hold the bar with a medium grip, similar distance to your bench press grip (not too close in but not so far apart that you compromise control of the bar). - Placing your feet approximately shoulder-width apart with your toes pointed either straight ahead or out an angle (no more than 30 degrees) is thought to be better for overall thigh development and is the squat style employed by most bodybuilders. - The wide stance (feet about two or more feet apart), toes pointed out allows you to maintain a more vertical upper body, reducing the torque on your lower back. 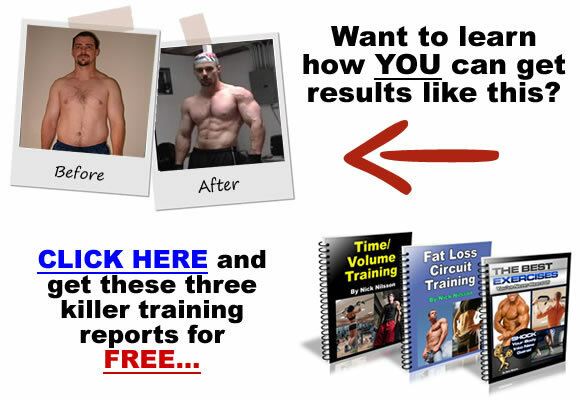 - Trainers usually find they can use more weight with the wide stance. Be very careful that your knees do not bow in if you do this version, however, as this stance can increase the likelihood of it happening. - Try both stances to see which you prefer or simply do both, varying your foot position on different sets or different training days. - Your feet are placed and you're ready to squat. With the bar comfortably on your back, lift the weight up from the racks and step back a few steps. - Bend your knees and squat down slowly and under complete control, with a slight arch in your lower back. - Look straight forward or a little up in order to keep your upper body more vertically oriented. If you start to look down, your back will automatically start to round over, placing extreme and possibly damaging stress on the lower back. - Some trainers recommend you go down only to the point where the tops of your thighs are parallel to the ground. There is some controversy as to whether or not it is safe or desirable to go further down than this. Personally, I prefer to squat down as far as I can (which is several inches below parallel) and have never had a problem. It is up to you how far you wish to go. - Now come back up. Push up from your heels until you are standing straight then go down for another rep. If you find yourself pushing primarily from the front of your feet, you are probably leaning foward too much. Try to focus on sitting back as you do the squat. - As you squat, be sure your knees are tracking straight up and down and that they are not bowing in or splaying out. Even though squatting is a very natural movement, it is also very easy to do it incorrectly. Here are some of the more common errors you will come across when squatting and what you can do to fix them. Error #1 - Your heels rise up off the floor as you squat down. Keep your eyes up, chest up, and sit back slightly. You most likely also need to work on calf flexibility by stretching regularly. Be sure to stretch out your calves thoroughly before each squatting session. This can occur if your lower back is the weak link in your squat. You must strengthen your lower back and strive to keep the arch in your lower back during the movement. Other tips you can try include lifting your toes up in your shoes as you squat down and gripping the bar closer in to your shoulders. If you find you lean forward excessively when you are squatting, you may have a problem with calf flexibility. To remedy this stretch your calves thoroughly. 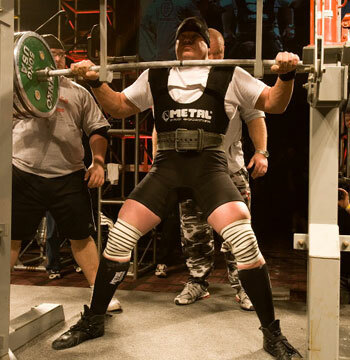 Some trainers squat with their heels propped up on plates to help with this problem, however, that doesn't address the root of the problem, which is generally calf tightness. Using too much weight will limit your range of motion and force you to concentrate on not getting crushed rather than doing the exercise properly. Stay within your limits. Not using enough weight can also be a problem. If you don't have enough weight on your back, your heels may have a tendency to come up as there is not enough resistance to force them down. You should still stay within your limits, but don't be afraid to push yourself a little. Don't do it! The change of direction should be deliberate, not bouncy. You can seriously injure your back and/or knees by bouncing. Wrap a weight belt loosely around your thighs and press out against the belt as you come up. If your knees buckle in then the belt will drop to the floor. If your legs tend to splay out, hold something, e.g. a volleyball, between your legs and keep it pinched there during the set. With the Smith Machine version you can place your feet farther forward and squat with your upper body vertical. While this may seem like a good thing (and it does make the exercise easier on your lower back), this version places a great deal of stress on your knees and is not recommended. Pushing against the bar at an angle is not a natural movement for your knees and results in a great deal of shearing force and torque in the cartilage of the knees. For the health of your knees, stick with the free weight version. Try wearing solid-heeled work boots when squatting. They allow the power from your legs to be transferred better than when wearing soft-heeled running shoes. The reason is simple: you can lose power at the bottom when wearing shoes with thick, soft soles (such as running shoes) because the soles will squish in when you push yourself up. If you don't have work boots, try squatting barefoot. You will not lose any power at the bottom that way. Going barefoot will also eliminate any heel elevation you may get from footwear. It will also force you to push with your heels. 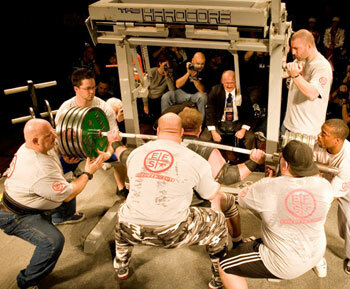 When you squat barefoot, set the racking collars a little lower to make up for the lack of soles. If neither is an option, use flat or thin-soled shoes. Basically, the less padding between your feet and the ground, the better. A plastic molded device called the Manta Ray is an excellent tool for squatting. I use one regularly and highly recommend it. There is no pain from the bar when you use this device. A towel wrapped around the bar or a foam pad can also help ease the pain of the bar but be aware that these things can slip or roll. Hold your hands on the bar fairly close in to your shoulders and keep your elbows pointed down the entire time. If you hold the bar too wide, this will force your shoulders to rotate internally. Your elbows will start to point towards the back which will then cause the bar to rotate forward as you come down. This, in turn, will cause you to lean over excessively, increasing the pressure on the lower back. Keeping your elbows pointed down activates your external rotator muscles, which will keep the bar from rolling forward. Hold a tight lordotic (lower back) arch on descent. When you start the movement, the knees should bend first, followed closely by the trunk. Most people descend with glutes leading, followed by the knees. This emphasizes the back and glutes rather than the thighs. This is characterized by excessive leaning over. - Yank down hard on the bar as though trying to snap it in half over your back. - It may sound counterproductive but if you do this while you are straining against the bar, it will cause an emergency stretch reflex in your quads and give you an extra little kick out of the bottom. - It is important to note that you must be moving upwards for this technique to work. The stretch reflex will not be activated if you are sinking down to the ground. Pulling down on the bar at this point will only make you drop faster. Normally, it is taught that you should never hold your breath during an exercise. However, there is a very good reason for doing so in the squat (be aware that I'm not advocating that you hold your breath through the entire exercise, just briefly at a certain point in the exercise). Here's why: your abdominal core is much more stable when you hold your breath. You need as much stability as you can get at the bottom of a heavy squat. If you are inhaling or exhaling at this point, you compromise your core stability. Much of the stress that was being supported by the intra-abdominal pressure of your contracted core muscles is then transferred to the lower back. By holding your breath just before you get to the bottom, during the direction change and as you start to come back up, you will have far greater core stability than if you breathe during that phase. This will result in greater power out of the bottom, allowing you to use more weight safely. Be sure that you do not hold your breath too long!! This period of breath-holding shouldn't last more than a few seconds. So next time you're going to do a leg workout, give squats a try. They really are one of the most productive exercises in existence and should be a part of most routines. The squat rack isn't just for barbell curls anymore!